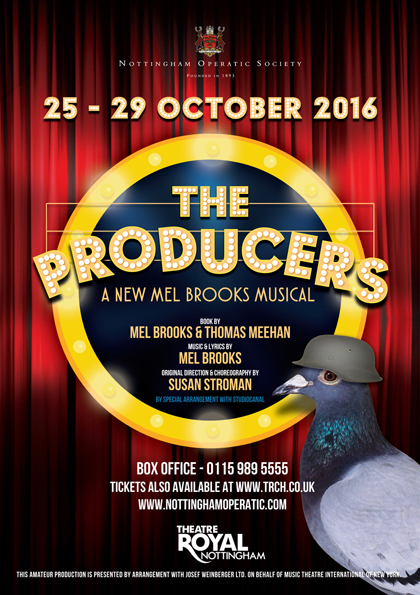 Allsopp Bookbinders are proud to sponsor Nottingham Operatic Society’s 2016 production ‘ THE PRODUCERS ‘. Since 1944 FF Allsopp & Co Ltd and partner company Sisson & Parker, of Wheelergate Nottingham have had a long association with Nottingham Operatic Society, first advertising in ‘The Cingalee’ programme in 1944, a charity concert in aid of The British Red Cross. Nottingham Operatic Society are proud to present for the first time in Nottingham’s Theatre Royal, Mel Brooks’ record breaking, 12 Tony award winning musical – The Producers. Originally produced on Broadway in 2001, it smashed box office records: “How do you single out highlights in a bonfire ?… It is, to put it simply, the real thing” (NY Times). Max Bialystock, a down and out Broadway producer whose latest work flopped on opening night, experiences a change in fortune when accountant, Leo Bloom, discovers money to be made in Max’s theatrical failure. They form an unlikely union to create the world’s worst musical – Springtime for Hitler! The plot develops with the help of the craziest bunch of characters, not to forget a horde of tap-dancing, zimmer-whirling old ladies. Book now for what may well be the funniest theatre night out next Autumn.